History of the project My Country – the Path of Changes dates back to 2009. At that time, a group of experts and enthusiasts, who were mostly focused on garden and landscape architecture, decided to encourage the care for public space, landscape and national heritage of the Czech Republic. As the organisation behind this initiative (Association Entente Florale CZ – Consonance) is based at Vyšehrad in Prague, the historic seat of the first Czech royal dynasty, the place of the promotional activities became obvious. A popular concept of presenting positive changes through the photographs taken “before” and “after” was chosen soon, too. The exhibition presents annually around one hundred examples of changes of neglected places into something new, positive, and useful. 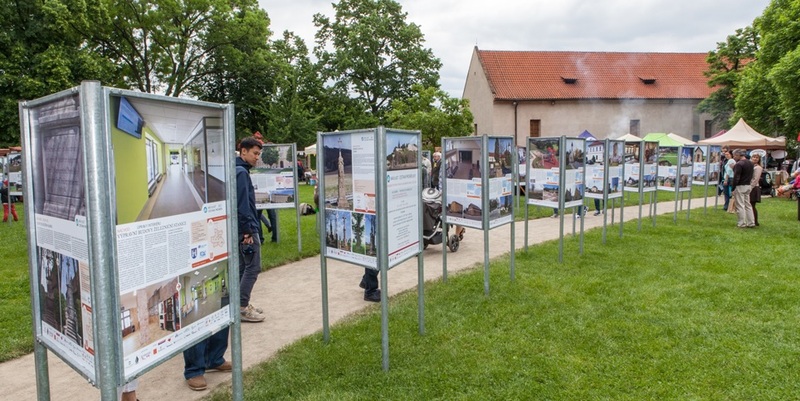 The changes are presented as a travelling outdoor exhibition that is launched at Vyšehrad in Prague every year in May. The ceremonial launch of the exhibition at Vyšehrad is a daylong event with regional products, live music, guided tour and more. The exhibition is displayed at this extraordinary historic place for one month and then it moves to different locations throughout the whole Czech Republic. You can visit it at various public places as town squares, railway stations, and parks. We have also special indoor collections that travel after libraries. Every year we award the most beautiful change presented at the exhibition. Through all the year you can vote for your favourite one on our website. The changes presented at the exhibition vary a lot in their themes, amounts of investment, and also motivation for the particular change. Many of them are initiated by municipalities, civic associations or private owners of the historical buildings or monuments. The changes cover a wide range of projects, from renovations of public areas in villages through reconstructions of schools and other public buildings, saving of grossly destroyed historical monuments, to recovery of parks, gardens or landscape areas. Some changes cost many millions of Czech crowns, others were worth just time of an enthusiastic group of friends. Many of these changes where co-financed from different state subsidies. Some were made under strict supervision of authorities responsible for preservation of the national heritage while leading contemporary architects and their studios were involved in others. Some of the changes are the results of voluntary cooperation of local inhabitants. Regardless of the variety of the changes presented, they all bring the message of our common concerns about the state of our country as well as our responsibility towards future generations and towards the environment around us. Annually, we cooperate with the Regions Authorities who are the official partners as well as the Vyšehrad Nacional Cultural Monument and other organisations. In 2018 we will celebrate 10. Anniversary of the project. Would you like to contact us to share your experience or to cooperate with us? We are open to fresh ideas and partnerships. We will appreciate your comments or questions at our contacts as well as sharing our Facebook profile. Although the whole website is in the Czech language we believe that you can easily browse through images of the changes presented, either through their summary or via an online map. You can also feel the unique atmosphere of this project in the gallery.